The site was approximately 0.8 hectare and situated adjacent to the River Medway on the location of a former gasworks and brewery. It was extensively contaminated with hydrocarbons and to a lesser extent cyanide from the gas production process. The remediation strategy for the Maidstone site was designed to address the on-site source contamination and indirectly the pathway contamination issues with the intention of protecting both human health and groundwater/surface water receptors; in particular the adjacent River Medway (Plate 4). The remediation work was conducted in two stages; the first phase was based on excavating and treating materials from the former gasholder bases and from hotspots in the vicinity of the former purifier boxes. During the second phase a reactive soil mixed barrier system was installed adjacent to the River Medway, the function of which was to protect the river from groundwater contamination. 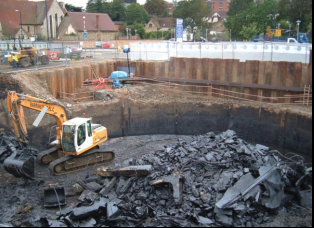 Phase 1 involved the excavation and ex-situ treatment of a total of 4,690m³ of contaminated material from the gas holders and purifier boxes between July and November 2006. The material was contaminated with typical gasworks pollutants, including PAH, TPH, Ammonia, Cyanide, Heavy Metals and Phenol. The contaminated soils were excavated, stockpiled and treated on-site using the Envirotreat E-clay technology. The Envirotreat treatment plant comprised of a slurry production unit and mixing zone. The slurry production set-up comprised of 1 No. 1000L paddle mixer (where E-clay reagents were combined before being pumped across to the mixing zones) and 1 No. excavator employed to mix the materials (Plate 2). The material was tested for leachate against preagreed clean up criteria before being reused on site, here it was redeposited in the void spaces left by the former gasholder bases. Phase 2 works consisted of installing a 120m long reactive barrier system during December 2006. This was installed using soil mixing techniques along the river retaining wall and across the site to intercept contaminated groundwater as it flowed towards the River Medway (Plate 3). Along the river wall and between the purifier boxes the wall was designed to be of low permeability. The second interlocking section, installed perpendicular to the river, was designed using Envirotreat’s E-clay Technology as a permeable barrier. This allowed groundwater to pass through while ensuring that contaminants were retained within the barrier by the E-clay.